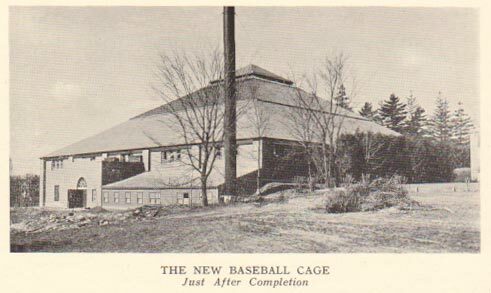 The text that accompanies this photograph from the 1927 Olio reads: "Early practice was permitted this year in the new cage which is a brick building 160 feet square with a height at the apex of 175 feet and includes a regulation baseball diamond. A heavy net in the shape of a tent 142 feet on each side hang from the center and sides of the cage falling two feet inside of the circular dirt running track. Also three lane nets 10 feet high and 45 feet long running out from one side enable three batteries to work at once. The team hitting is expected to improve with the installation of a pitching machine." 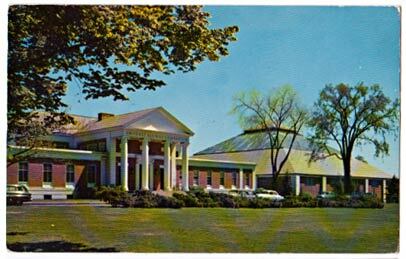 The Cage in the 1960s, next to the Alumni Gymnasium. It underwent extensive renovations recently, and it used for both athletic practice and campus events.